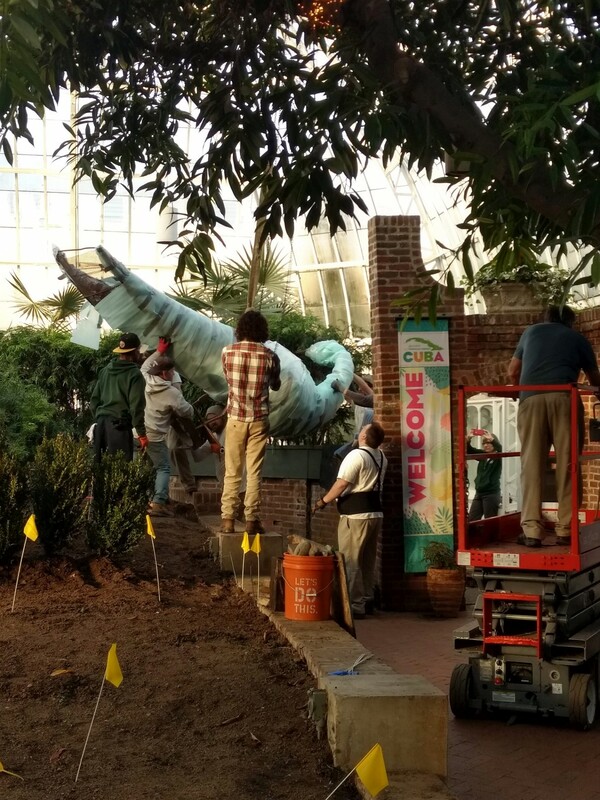 In January I started working at Phipps in the new position of exhibit associate, and my first project was something very special — preparing our beloved topiary peacock for Spring Flower Show: Gardens of the Rainbow! 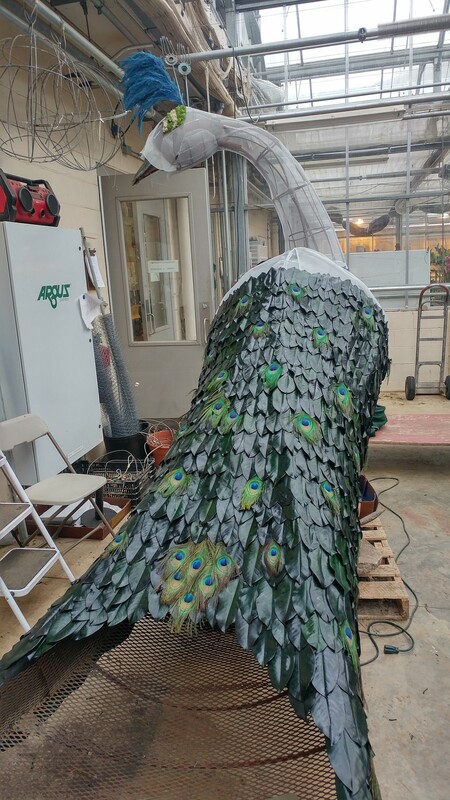 The process started with the 9-foot peacock frame being delivered from storage to a greenhouse to be worked on. He was delivered in two parts, the body and the wings. The large peacock form is made out of metal rebars, similar to those used in concrete construction. Once the wings were attached, he was wrapped in a fine mesh so that dried materials — natural plant materials that have been dried or preserved for use in floral display — could be attached to him. 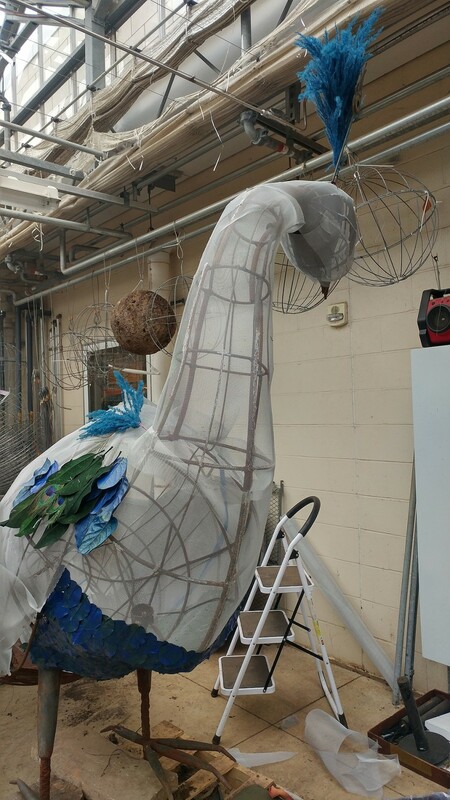 Over the next several weeks I fabricated different samples and combinations of materials that were attached to the peacock and we continued discussions. Preserved magnolia leaves were chosen for his wings with really peacock feathers to add color and depth. Each leaf was individually glued in place using a glue gun. Application of the magnolia leaves started at the tip of the wings, overlapping each one. Then each row of magnolia leaves overlapped the next, continuing toward his head to resemble the overlapping of bird feathers. Preserved Gaultheria leaves (also known as salal or lemon leaf) painted blue were placed underside up to create his colorful breast, curling the tip of each leaf for a feathery appearance. Dyed rooster feathers added color and movement to his breast, and cut and painted salal leaves created a smooth surface on his head. His eyes are finished off with white felt and painted salal leaves. 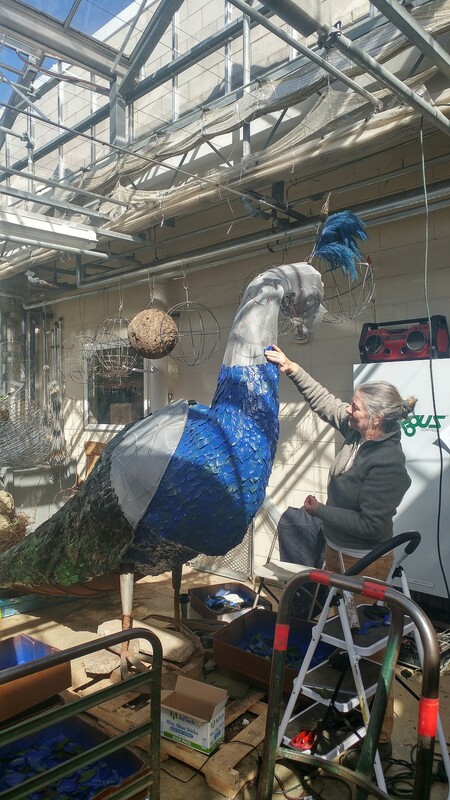 Once the peacock was positioned in place — a process which involved hoisting him over the South Conservatory wall, since he was too large to fit through the door! — his tail was carefully laid out and planted with green and purple Alternanthera, black Ophiopogon and blue Lobelia. Our incredible peacock now stands on a green lawn surrounded by blooms in complementary colors of blue, orange, yellow and purple to make him pop, and he looks over his shoulder welcoming guests into his room, the South Conservatory. Visit Spring Flower Show: Gardens of the Rainbow to see him in person through Sun., April 21! I absolutely love Phipps Conservatory, there is something new, exciting and beautiful around every corner. Just amazing. He looks magnificent and the process is both inspired and inspiring!